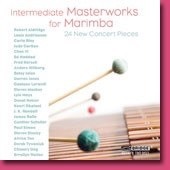 24 New Concert Pieces; double-CD. Released on Bridge Records. Nancy performs pieces by Carla Bley, Lyle Mays & Paul Simon. 7 other marimbists perform 3 pieces each. A unique opportunity to hear many players side by side, while becoming acquainted with this pivotal collection of excellent solo marimba compositions.